Libby Gill is the former head of communications and also public relations for Sony, Universal, and Turner Broadcasting. The topic is “The Hope Driven Leader: The Science of Hopefulness Derived from the Medical and Positive Psychology Communities”. Health care is quickly changing, especially since nurses are on the frontline of the future. Our guest Libby Gill has an impressive bio. She was the branding brain behind the launch of the Dr. Phil Show. What inspired Libby to write the book, “You Unstuck: Mastering the New Rules of Risk Taking”? Your mindset matters. The beginning of the book probes how your attitude affects your legal nurse consulting success, and also how you can make it your friend. One of the best ways to demonstrate your expertise is to ace a presentation to attorneys – at a conference or at their law firm. Four chapters go into depth on techniques to master public speaking. 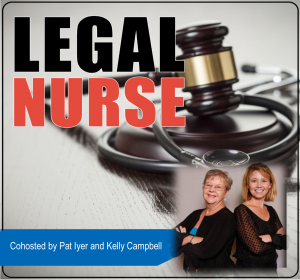 You’ll be inspired by the stories of how 5 experienced legal nurse consultants started and grew their businesses. Section 1 asks the provocative question, “Are you your friend or enemy?” Mindset matters for success. Get inspired by the techniques for tackling adversity. Section 2 helps you take advantage of one of the best ways to grow your business – to teach attorneys. Making presentations to attorneys is an excellent way to demonstrate your expertise and prove your value. Four powerful chapters give you the specifics on preparing for and delivering a polished professional presentation. Section 3 has pure inspiration. Five experienced legal nurse consultants share their stories of how they got started and grew their businesses. They reveal their triumphs and challenges. Get your copy at http://lnc.tips/Creatingseries. Use the code Listened to get a 25% discount on the book. Libby Gill is now CEO of LA-based Libby Gill & Company, an executive coaching and consulting firm. She also guides emerging and established leaders at organizations including Abbott Medical, AltaMed, ADP, Capital One, Disney, Edwards Lifesciences, Genentech, Honda, Intel, Medtronic, Microsoft, Silverado Senior Care, Sony, Sutter Health, Viacom, and many more to inspire purpose and ignite performance. Libby is the author of four books including the award-winning You Unstuck and Capture the Mindshare and the Market Share Will Follow, Libby has shared her success strategies on CNN, NPR, the Today Show, and in BusinessWeek, Time, The New York Times, Wall Street Journal, and many more. Libby’s latest book is The Hope-Driven Leader: Harness the Power of Positivity.